Kylie Jaxxon’s The Trace, until recently located on the region of Celestial Realm, has appeared in a few articles in this blog, although I’ve never actually written directly about it. 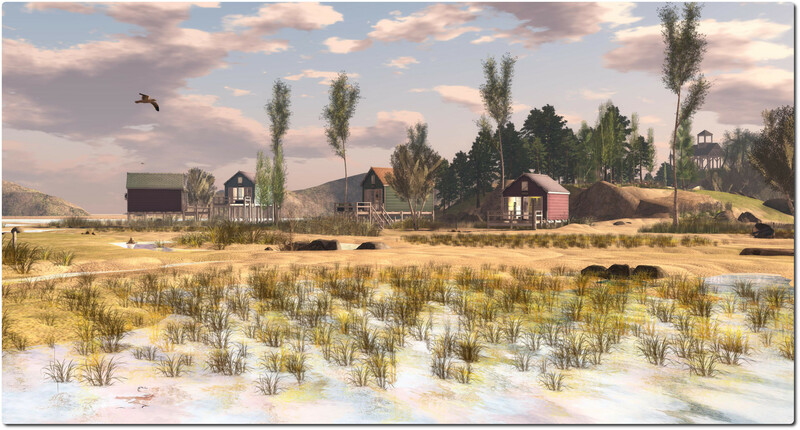 Given Kylie has now moved to a new homestead region she has named, appropriately enough, The Trace, I thought it high time I rectified matters and, with an apology to Kylie for my tardiness, actually sat down and produced a post on her home. And it is certainly worth writing about; The Trace, in its current incarnation, is nothing short of a splendid Second Life watercolour. The level of composition here is extraordinary, from the lay of the land through the selection and placement of buildings to the region windlight settings, all of which come together to present the visitor with a most remarkable and natural coastal setting, which could have been lifted from almost anywhere in the western world, but which had me thinking of somewhere on the New England coast, or perhaps situated on England’s Norfolk coast (even allowing for the offshore islands!). The west side of the island is low-lying sand dunes, waterlogged here and there and bearing wild grasses across them. A tide laps idly against the sand, and gulls wheel overhead (do have local sounds enabled when visiting). A little further inland sit several beach houses, all mounted on sturdy wooden piles, suggesting these low wetlands can be subject to high tides or flooding through the year. Wooden board walks run between the houses like old railway sleepers, and point the way inland, where a line of low hills rise up to the east and north, their far sides forming a line of cliffs, complete with narrow beaches facing the sea. Nestled between the hills, towards the centre of the island is a little meadow-like area where sheep graze close to a potting shed. Up on the hills one can find more to see, in the form of a Victorian folly, with outdoor seating positioned around old gas lamps – just mind you don’t stray too close to the sprinkler that’s caring for the grapes growing close by. From here, one can wander south to the old boathouse and the wooden lighthouse beyond, or travel north and uphill to the highest point on the island to a wooden pavilion which appears to be serving as the local school-house. This overlooks the cliffs and beach to the east of the island, and down below it to the west, a rather unusual tree house rising from fen-like waterlogged grassland and surrounded by a small copse of trees. A series of stone paving slabs laid atop the sands allows the visitor to reach the stairs leading up to the treehouse without getting their shoes too wet. As you might gather from the description, this is a very open environment where visitors are free to wander or sit, depending on the mood, and which offers a relaxing environment for exploration, one which is ideally suited to taking pictures and with trying-out different windlights. 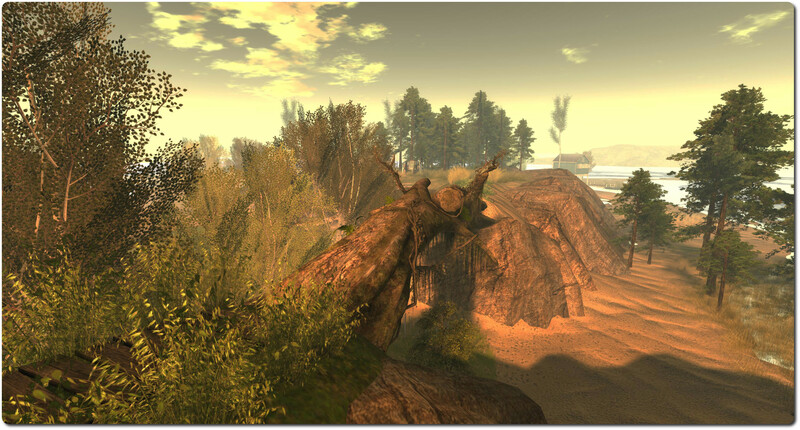 And like a visit to a real coastal region, time spent at The Trace can leave you feeling reinvigorated and ready to face the challenges of Second Life once more. Rezzing is allows in the region, so if there are props, etc., you’d like to set-out for a photo shoot, you can do so without needing to join a group. However, if you do, please do be sure to make sure you pick-up your things afterwards. and don’t forget The Trace Flicker group, where people are invited to post their shots of the region. All-in-all, this debut of The Trace in its new home is more than worth a visit; should you choose to do so and enjoy what you see as much as I did, please show your appreciation via one of the donation cans located around the region. 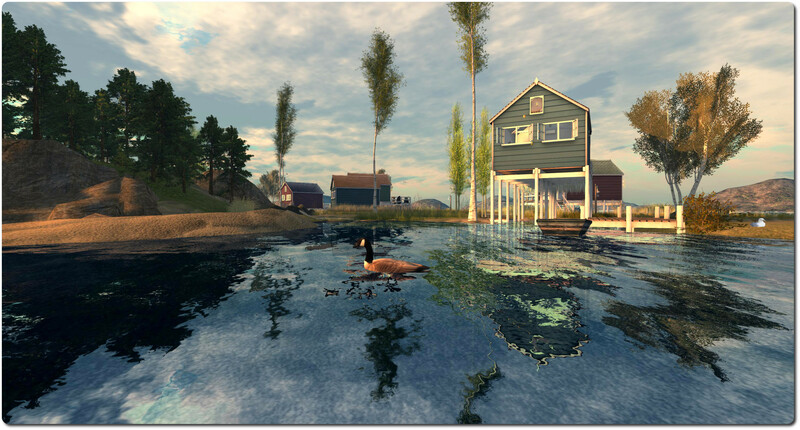 Second Life’s role in eduction has been something of a focus of late. 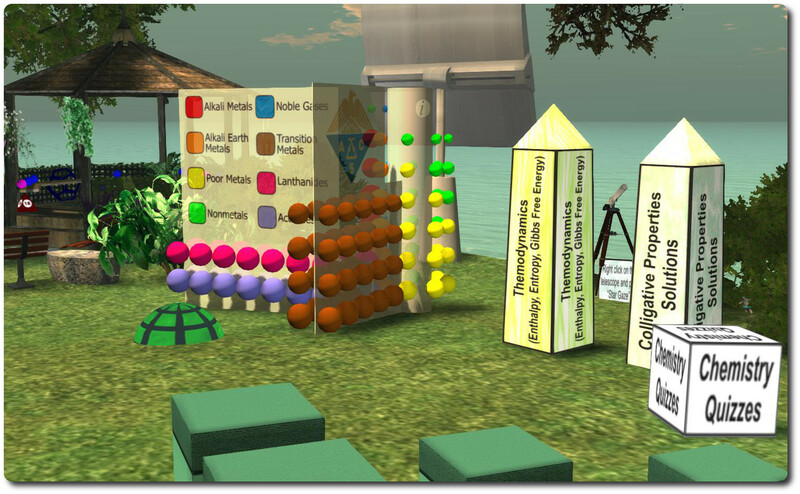 Earlier in April 2014 we had the 7th annual Virtual Worlds Best Practices in Education conference once again taking place in part in SL, and which featured the Lab’s CEO, Ebbe Altberg fielding a raft of questions from the audience. A recent segment from the Drax Files Radio Hour featured Liz Falconer, Professor of Technology Enhanced Learning at the University of the West of England (UWE), and Stylianos Mystakidis, E-learning Manager for the Library and Information Centre at the University of Patras, Greece. Now the education theme continues with the latest instalment of The Drax Files, with a look at a unique experiment in learning being conducted by Wendy Keeney-Kennicutt of Texas A&M University and Kurt Winkelman from the Florida Institute of Technology, focused around students studying chemistry. 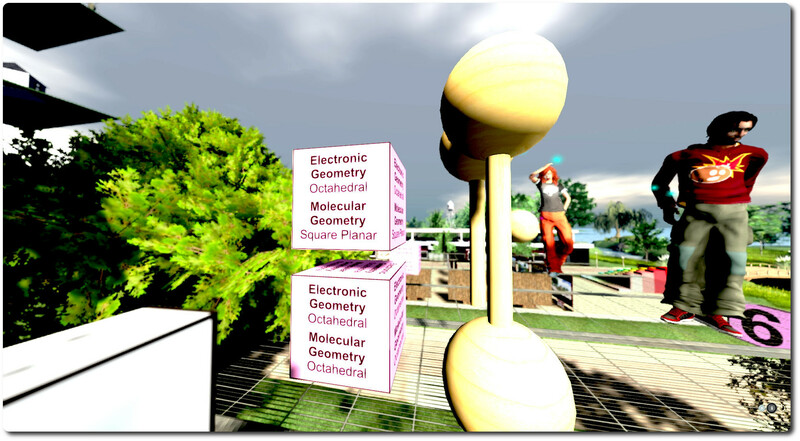 “Specifically with chemistry, Second life is an amazing thing. 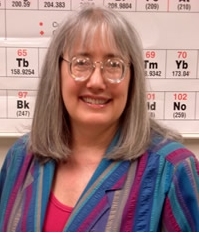 So much of chemistry is based on [the] shapes of molecules and understanding the 3D nature,” Wendy says of the in-world science classes she oversees, and why chemistry in particular is a good match for Second Life. Texas A&M University operates an impressive, multi-region faculty within Second Life, complete with a dedicated web page in the university’s Instructional Technology Services website. Within the faculty regions sits “Dr. K’s First Year Chem Program”, which offers a grounding in chemistry in an open-air, interactive environment. This is where Wendy teaches chemistry in a manner she notes – and despite the cost of SL regions – is apparently more cost-effective than purchasing dedicated modelling software, because SL offers a much more flexible working and creative environment than dedicated tools may provide, and can thus be better utilised to suit the needs of her students. Up in the air above a portion of the faculty regions, and restricted to access by students, staff and invited guests, sit a number of research areas. It is here that Wendy, alongside Kurt Winkelman, studies the impact and effectiveness of teaching within a virtual environment when compared to more traditional classroom-based teaching. The study is funded by a National Science Foundation grant, and has grown out of a pilot programme run in the autumn of 2013. For this work, Wendy uses two groups of students, each of whom is following the same course programme, with one group working in Second Life on the sky platforms, and the other working entirely in the real world. 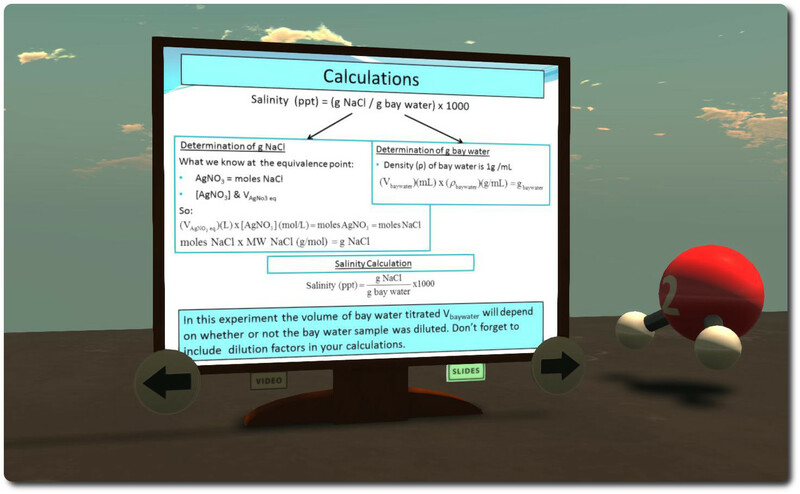 Within the virtual learning environment, efforts have been taken to present students with much the same requirements and activities their counterparts have to perform in the real world: gases must be handled, weighed, measured, etc., just as they do in a real-world lab in order for valid results to be obtained. The study is currently at the half-way mark, and due to complete in April 2015. One of the interesting outcomes of the study is that those students in SL behave in very much the same way as those in the real world chemistry lab. The same caution and responsibility is demonstrated in handling and manipulating butane as would be expected in a real chemistry lab, despite the risk of injury resulting from the flammable nature of the gas obviously being non-existent in SL. This in turn has resulted in the students working within the SL environment to retain a kinesthetic ability in using and manipulating the science equipment which is on a par with that demonstrated by the students working the physical equipment. More interestingly, the students working in the SL lab reported they enjoyed themselves far more there than in the real lab, and felt they were much more focused, and suffered from less distraction. Even their ability to read-back and interpret data appears to be significantly better than seen within the real lab. The kinesthetic learning (also known as tactile learning, wherein the student learns by carrying out a physical activity) results evident in the programme are interesting, as are the overall results to date. The findings so far released as a part of the study – notably the results of the pilot programme – tally very well with the benefits of situational learning discussed by Liz Falconer in episode 15 of The Drax Files Radio Hour, where she noted the benefits students experience through narrative learning. 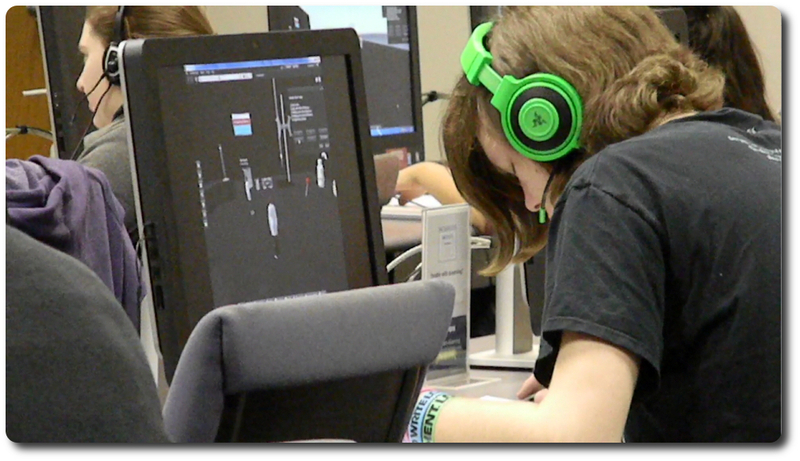 While chemistry is more a procedural activity than a narrative undertaking, the approaches used in the SL environment point very strongly to students working within the environment reacting in a similar manner to those placed in situational learning environments: their kinesthetic abilities are sharpened, even though the level of interaction with the equipment they’re using is very different to that of the physical lab, as noted above. Also of interest is the observation made as a result of the pilot programme that the artificial nature of the SL environment caused the students to be more focused on procedure and technique, rather than on results – a very important aspect of research chemistry. There is still another year to go with the primary study, but the results, as indicated by Wendy in the video, seem to be reflecting those obtained during the pilot programme. as such, it’ll be interesting to see what does emerge when findings are fully published. In particular, it’ll be interesting to see if the finding examine the role played by aspects such as the viewer UI in shaping students’ experiences and learning abilities in the SL-based environments (e.g. were better results obtained purely because students found the virtual environment a more enjoyable environment for learning, or because the nature of the viewer UI encouraged a greater need for focus and help eliminate more common elements of distraction among students?). Towards the end of the video, Wendy (Julia Tiraxibar in SL) talks more broadly about the potential of Second Life for education and educators, and makes some interesting and valid points about students travelling around SL (remembering that we’re talking here about students 18 and over, and therefore with the freedom of movement we all enjoy in SL). Her remarks here match the common-sense attitude expressed by Liz Falconer in episode 15 of The Drax Files Radio Hour. This is another excellent video segment, one which takes a slightly different tack to others in the series, but which again offers much food for thought and which certainly stands as a very focused piece which would appear to be ideally suited for helping promote SL within the education sector. As such, it is one I’d strongly encourage teachers and educators to bookmark and not be afraid to show to colleagues – and indeed, for students to put before their teachers and faculty staff. As always, please refer to the server deployment thread for the latest updates and news. On Wednesday April 30th, all three RCs should receive the same maintenance package. This comprises the same fixes as deployed to the Main channel and sees the Magnum RC rejoin BlueSteel and LeTigre with AIS v3 support, which requires the use of the Sunshine RC viewer. As per my recent post, the Lab have updated their SL system requirements page for Windows and Mac OSX to better reflect the public status of both operating systems. There is an official blog post on the subject as well, which essentially confirms that Windows XP and OSX 10.6 are considered as no longer supported. While accessing SL from computers using these OS versions will not be blocked, users will no longer be able to obtain SL-related support should they encounter issues, and the Lab is advising people update wherever possible. Additionally, the Lab is updating the Windows installer so that it will verify whether the latest service packs for Windows XP versions have been installed, otherwise viewer installation on XP will be blocked until such time as the relevant service packs have been installed. The aim here is to help people enjoy improved stability in the SL experience. However, once these new requirements come into effect, they may cause some upset among those affected. How widespread this is liable to be is debatable; the Firestorm team have been running a similar process since the release of Firestorm 4.6.1, and they are reporting minimal complaints from among users. Following the last group chat tests on Aditi, Simon Linden reports that the optimised code has been deployed to a production server this week, but it is liable to be a little while longer before it is deployed to all of the chat servers, and time will be taken to see how it behaves with traffic on the server on which it is currently running. Baker Linden is back on code merges for the viewer. It is thought he may have hit one or two problems, so assuming he makes the Server Beta meeting on Thursday May 1st, we may find out if this is the case and what is happening. Expectations on what these are liable to be, how they will work, what limitations may be placed on them, and so on, is still running high, particularly after Danger Linden (Don Laabs, Linden Lab’s Senior Director of Product) mentioned them recently. As I’ve covered previously, the experience keys are essentially the culmination of a project which was initially prototyped with the Linden Realms game, and which have since been going through continued development, re-definition and enhancement and which should – hopefully – be appearing in the near future. There is a known issue which can cause issues when the viewer is trying to connect to a region. In these circumstances, the viewer receives URLs containing the host name, but not the required “.agni.lindenlab.com” (e.g. to something like “https://sim10586:12043/cap/…&#8221; is received, rather than “https://sim10586.agni.lindenlab.com:12043/cap/…&#8221;). This causes the viewer to fail to connect to the various capabilities using the URL calls, which in turn results in things like mesh load failures, inventory load failures, L$ failures, and so on, as well as having bad URLs shown for http-in. See also BUG-4704. Update: the requirements for ervice pack installations has been revised following clarification from Tankmaster Finesmith – see comments below. 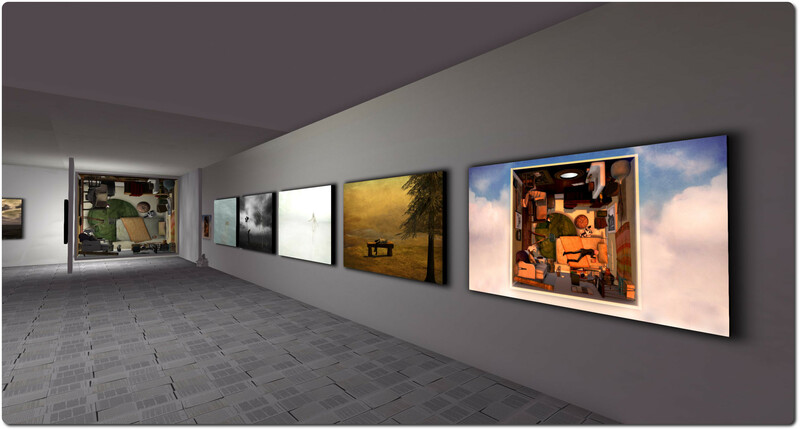 Linden Lab has updated the Second Life system requirements page to better reflect the current status of the Windows and Mac OSX operating systems. The new requirements list Windows Vista, Windows 7 or Windows 8 as the minimum OS requirements for Windows systems and Mac OS X 10.7 or better for Mac systems. 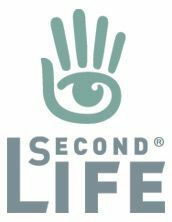 While there are no moves to actually block older operating systems from accessing Second Life, the Lab notes that assistance will no longer be given to users accessing Second Life on unsupported operating system version. Additionally, the Lab is updating the Windows installer so that it will verify whether the latest Service Packs for Windows XP versions have been installed, otherwise viewer installation on XP will be blocked until such time as the relevant service packs have been installed. This means that the 32-bit Windows XP will be checked for the presence of Service Pack 3, and the 64-bit Windows XP will be checked for the presence of Service Pack 2. We have removed Windows XP and Mac OSX 10.6 from the list of supported operating systems. Microsoft has announced the end of support for XP, and it has been some time since Apple has released updates for 10.6. For some time now, the Viewer has been significantly less stable on these older systems, and the lack of security updates to them make them more hazardous to use. We have no plans to actually block those systems, but problems reported on them that cannot be reproduced on supported systems will not likely be fixed. The Windows installer has been modified to verify that the system has been updated with the most recent Service Packs from Microsoft. While we will not block installation on Windows 8 at this time, we strongly recommend upgrading to 8.1 for greater stability. Our data shows that the Viewer is significantly less stable on systems that have not been kept up to date, so the installer will now block installation until the updates have been applied. This change will be effective in a Viewer version to be released in the next few weeks, so it would be a good idea to get your system up to date before then. You can find information on how to install the latest updates at the Microsoft Windows Update page. Firestorm implemented a similar policy where windows is concerned with release 4.6.1, and STORM-1966 (from Tankmaster Finesmith of the Firestorm team) has been put forward as a means of enforcing similar controls in the Lab’s Windows installer. This code is due to appear in the upcoming STORM viewer release candidate. For details on the availability of the STORM RC, please refer to my Current Viewer Releases page, where I list it as it becomes available. Berry posted another of her Monday Memes on (oddly enough!) Monday April 28th. This one, called “my blogging journey“, is a follow-up to her “Why do I blog?” meme from 2013. As I responded to the latter a little late in the day, I thought I should also respond to “part 2” – and get it done a little earlier this time! Do you have a mission statement for your blog, if so, what is it? Not really. I just try to be open and honest in my writing, whatever the subject of an article. How do you feel about blogs that use their platforms to spread negativity? It depends. Those that have a completely myopic view of things or seek to be deliberately and negatively confrontational on matters, I ignore. However, there are some which are predisposed to lean towards the negative (notably when writing about LL) or which may proceed from a false assumption or carry misconceptions that I do read, because they challenge me to try to look at issues more broadly. If you could switch blogs with another blogger who would it be? Not sure about “switch”, but there are two bloggers in particular I admire and I’d name here: Honour McMillan and Tateru Nino. 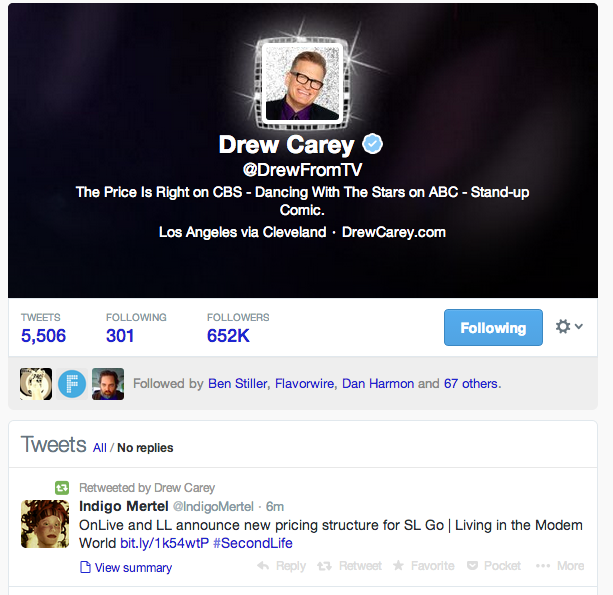 Both have a wonderful capacity for insight and observation and beautiful word craft. I also envy Honour’s eye for photography (and Ziki’s, and Bear’s, and Berry’s, and Loverdag’s, and Derry’s, and Asa’s, and Thorin’s, and Miles’, and ….). Has your blog/blogging style evolved over the year(s)? How? I hope so. I started blogging on a specific subject (drawing on articles I’ve had published elsewhere & then re-wrote to give them an SL focus). Then I started writing more widely on subjects, and as my ignorance of certain aspects of SL became increasingly apparent, I tried to educate and inform myself. I hope that’s reflected in my writings here over the past few years. When it comes to Second Life blogs, there are different styles: Fashion bloggers, Lifestyle & Travel bloggers, Informative bloggers, and more. Which style do you prefer and where do you feel your blog fits in? I hope my blog covers a number of these areas. The only things I’ve made a conscious decision not to blog about are fashion, product reviews and in-depth content creation pieces. I’m not particularly fashion conscious in RL & I’m not the world’s greatest creator of content. So in both of those instances, anything I blog would be a grandmother and egg-sucking scenario. While I have been known to review products, with one exception, I’ve only done so for items I’ve purchased and really liked for myself. That exception was a review of Erick Gregan’s Spitfire Mark IX. That did come to me as a gift from Erick, but not in any expectation of me blogging about it; it was purely a “thank you” (and quite unexpected) for some assistance I gave when poking at some region crossing issues in 2013. And even then, I wrote the review because I love flying it in SL! What has blogging taught you? Consideration and forethought. I hope. Share your top 3 tips for new bloggers. Write about what interests you. Don’t be afraid to buck the trend; just because people are all blogging on X or with opinion Y, doesn’t mean you have to as well – just be true to yourself and speak from the heart. Don’t be afraid to admit mistakes, and take the time to understand a point-of-view or a topic before you blog. I’ve made a number of mentions in this blog on the subject of Whiskey Monday’s remarkable imagery, which has been displayed through various galleries, has been featured in SLB celebrations and is even available in RL. Her work is thought-provoking, intelligent, evocative, mischievous, fun, pointed, and more – and all of it is certainly some of the finest expressions of art as a medium for social and general commentary I’ve ever seen. It’s also deeply personal, much of it reflecting on Whiskey’s real life and times in a frank, honest way free from pathos while laying bare her mindset and emotions. 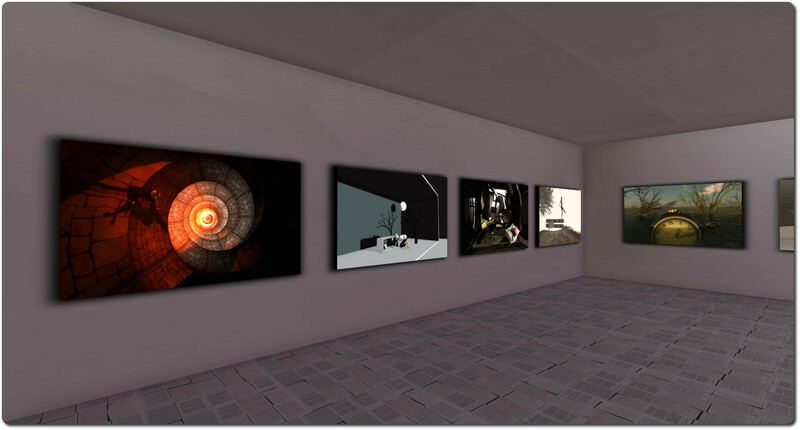 For some time now, Crap Mariner has hosted a collection of Whiskey’s pieces, both her art and her Tweets as Picture series, located at The Viewing Room on his region of Edloe, and which sits directly under The Listening Room. However, Whiskey herself has been absent from the virtual for some time now – her last blog post having been made in November 2013, while she ceased activity on Twitter and Plurk some time before that. While it is hoped that Whiskey will make a return to Second Life, time does march ever onwards, and Crap has been contacting those who knew Whiskey to let us know that he’ll be closing down The Viewing Room in the very near future as a part of some redevelopment work on Edloe. So, if you’ve not seen Whiskey’s work there in a while, or haven’t had the chance to see her work up close, now is very much the time for making sure you hop over to The Viewing Room before it is too late.